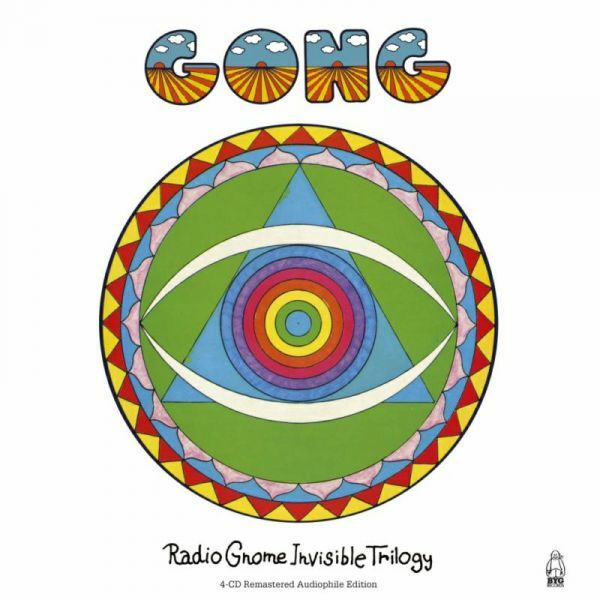 On October 30, 2015, Charly Records reissued Gong’s three Radio Gnome LPs (Flying Teapot, Angels Egg, and You) as both a 3-LP box set and a 4-CD hardback book. Each 180-gram audiophile vinyl LP was mastered from the original tapes, while each CD was digitally re-mastered. The LP box includes facsimiles of four extremely rare promotional booklets of Daevid Allen’s artwork (including A Pocket Introduction to the Planet Gong and How to Construct the Planet Gong Power Symbol), the complete trilogy narrative, lyrics, and philosophy, along with the original LP artwork, full band line-ups, credits, and rare photos. The CD hardback book contains the same items in a 60-page book plus a fourth CD of bonus material including both sides of Gong’s impossible to find debut single, released only in France in 1970 (“Est-ce Que Je Suis?” b/w “Hip Hypnotise You”). Unfortunately the promo I received is a single CD sampler containing 8 songs, two from each of the four CDs. From what I can tell, the sound on the three re-mastered CDs is much cleaner and crisper than the prior CD reissues. CD 4 remains a mystery to me as the sampler only contains “Est-ce Que Je Suis” and “Love Is How You Make It.” “Est-ce Que Je Suis” is crazed French madness / gibberish with occasional snorts, no instrumentation. “Love Is How You Make It” is a minimal a cappella song. The other songs on the fourth CD are “Flying Teapot (Alternate Mix),” “Eat That Phonebook Coda (Early Version),” “Other Side of the Sky (Single Version),” “Ooby-Scooby Doomsday or The D-Day DJ’s Got the DDT Blues,” and “Hip Hypnotise You.” As most everyone either owns the Trilogy LPs or CD reissues, fans will be curious about CD 4. It is a shame that the sampler promo did not include all of CD 4 as I cannot determine if the Bonus Disc is worth the investment. If you have never heard Gong or don’t own any of the Radio Gnome discs, then either the LP or CD set is for you.